Buying a new replacement srs airbag module is expensive and most of the time must be special ordered at a local dealer. 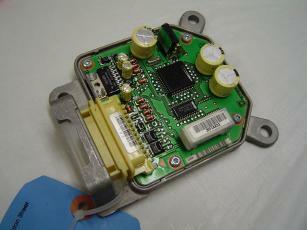 An srs airbag module purchased from salvage yards often contain crash codes and are inaffective without additional intervention by a scan tool or technician. By resetting the vehicles original SRS airbag module, auto repair shops across the country count on our reset services to lower the cost of rebuilding vehicles. During the reset process we simply read and clear any airbag codes present in the air bag computer. All other data is left intact, therefore, in most cases an additional trip to your auto dealer can be avoided. Once you have replaced the necessary SRS air bag components that activated during the accident, you can install the airbag module to clear the airbag light and the SRS system is reactivated. If you would like to have your airbag modules reset. Select the year, make and model of your vehicle and click the "Reset Module" button to get started. Instructions on how to mail us your module will be sent to you by email.